!NEWS! Big EYED Art !NEWS! Finally a book all about the big eyed masters we love so much! I am currently at work on a book with co-writers Matthew and Lisa sweet, which will include bios and beautiful examples of paintings by artists such as Keane, Gig, Maio, Igor, Franca etc... The book will be published by Last Gasp. Due out sometime next year-- Additional information will be posted soon! Zoom on over to Kay*bee toy stores to catch the first series of these big eyed dolls that obviously borrowed their entire design from the classic 1972 Blythe doll. The dolls come in 4 different styles and second set is due out soon. Visit virtual dolls for more info. Walter Keane passed away on December 29th 2000. 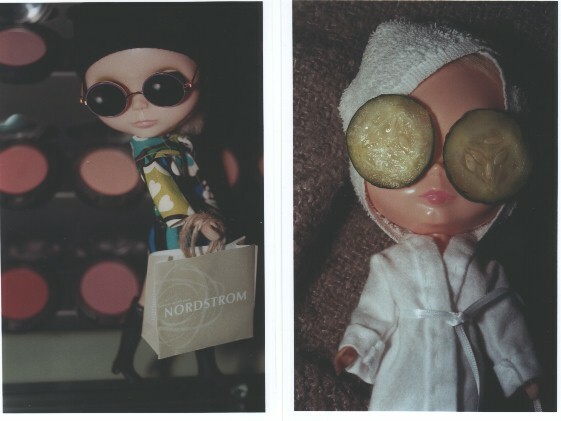 Gina Garan, the photographer responsible for documenting the fabulous life of the fascinating big eyed doll Blythe, in her wonderful book "This is Blythe"... had this to share "here are a few of the photos from blythe's nordstorm campaign. it'll be in all the US nordstrom stores (in the cosmetics dept) in april. i think it'll be a gift w/ purchase - the "gift" is a 32 page mini blythe book." Thanks Gina! Someone send me an email when you spot one. I don't want to miss this!!!!! HAPPY NEW YEAR, here's some big eyed items to bring in the new millenium! Nothing to much to report on, but this should be a wonderful year for the world of the sad eyed waifs. The Margaret Keane and Keaneabilia show closed on December 31st and seemed to be well recieved. Here's a nice review. Also, Fox News did a piece on big eyed art and used a photo of a couple of my gig statues. they are so cute, see for yourself. Some people just can't get over Margaret Keane's signature big eyed paintings, for some reason the staring gazes of small children actually spook people- for example scroll down to, The Evil Portrait, a ghost story based on woman's experience with a Keane painting. Also Wayne Hemingway recently published a book that you will enjoy. It is called "Just Above The Mantlepiece: Mass-Market Masterpieces" and is a thick coffee table style book that features many of the big eyed prints that you may remember from your childhood. It can be ordered from amazon.com, just click on the cover to take you there. The Margaret Keane and Keanabilia show seems to be well received. There have been many reviews and here's an example of what people are saying about the show. This particular article is by art critic Robert Pincus at the San Diego Union tribune and so far is the most accurate. Read about it now! A television program called Internet Tonight featured a spotlight on big eyes. Unfortunately I missed it. The surf guru answers the question, "Where can i find big eyed art?" The link to the answer is here- if anyone saw this or the story that ran on C/Net TV about big eyes... Please write. I'm dying to know what they said and how campy it was. Great artwork in the new movie Ready to Rumble , which stars Rose McGowan. 3 big eyed portraits that resemble Rose are seen in the movie...The woman who painted the three portraits did an amazing job! For all of you KEANE completists out there, you should check out the new release from Matthew Sweet. It's cover artwork and insert, features a beautiful 60's painting by Margaret Keane. For the time being- it's the only place you'll be able to see this masterpiece and I shouldn't forget to mention that the music is good too. Check out matthewsweet.com for more info, or buy, In Reverse, Now!.